Villa Panorama is a beautiful two stories property about220 sqm. It has private courtyards, gardens, dining pavilion and a 130sqm private pool. The includes a smaller kiosk, BBQ and a spacious parking place. It is nested in a delightful property covered with olive groves. 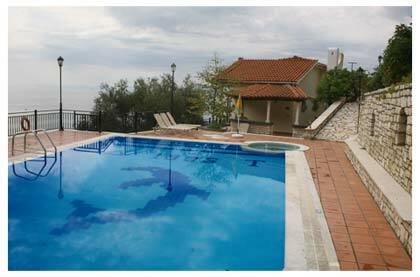 Panorama boasts spectacular views along the coastline and down to Albania and Corfu town. Villa Panorama can entertain 8 individuals and includes: First floor with 2 bedrooms, kitchen, dinning room, lounge, veranda, bathroom (with bathtub) and fireplace. Ground floor: 2 studios (one with fireplace twin beds, full equipped kitchens. Outside the ground floor there is a large courtyard 200sqm.